The recommended job conditions to apply a waterproof system, it’s up to you to have this knowledge. Despite their ease of application and superior waterproofing abilities, there are lots of things to consider before applying a waterproof membrane system. The more education you have on the materials used and the ideal application conditions, the better prepared you are to undertake the job. As you and your employees become better educated in the application processes, you can provide superior customer service and guarantees. Ideal preparation and conditions for applying waterproof membranes. The point behind applying a spray-on waterproofing system is to get the polymers and elastomers to bond with the substrate surface correctly. Without this bond, water tightness cannot be guaranteed. To guarantee the bond, the substrate must be very clean. Any dirt, grease, mildew, mold or grime has to be removed completely. In certain cases a power washer is recommended, especially for basement or foundation applications. If an elastomer is applied over dirt or grease, it will eventually bubble and break the monolithic seal. All substrates have to be dried thoroughly before the waterproofing membrane is applied. Again, the material cannot bond or adhere properly with damp substrates. A wet surface will also result in water being trapped between the film and the substrate. This can cause lots of problems, especially in colder climates. In some cases construction companies will use heating devices to blow warm air over the substrate to get it to dry quicker. Bad substrates. Cracks or rotten substrates must be repaired or replaced prior to application. 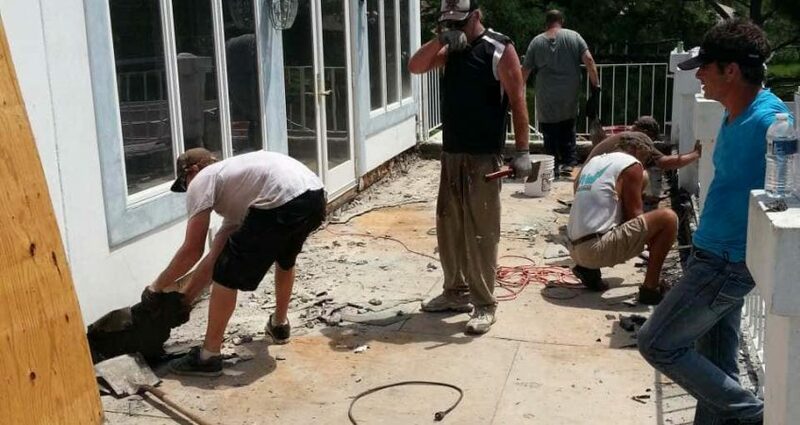 It is useless to apply waterproofing over rotten concrete, wood or metal. If the damage is extensive, a different contractor may have to be hired to repair/replace it prior to the waterproofing system being applied. Environmental conditions are a factor in applying waterproof membranes. It’s not enough to just get things clean and dry, there are other considerations. You need to make sure that you are applying waterproof systems in temperatures best for the material. Anywhere from 55 degrees Fahrenheit up is fine. If it gets too cold when applying, you will not get a proper spray pattern, and the liquid will start to get sluggish. Certain waterproofing membrane liquids use additives to prevent this from happening, but your best bet is to avoid cold temps when applying. Weather. You should not apply the membrane system in a rain storm. The issue is not the membrane material, but the substrate. When your substrate isn’t dry, you cannot apply the waterproof system. If you are working inside this isn’t a problem, but exterior surfaces are a different matter. If a storm is forecast for an area, you can do some tarping to protect your horizontal surfaces, but there will still be a drying period before application. High winds will disrupt the spraying so they should be avoided. Soil make-up. Depending on the amount of carbon (hydro-carbons) or sulfates in the soil surrounding basement walls, you will have to choose different waterproof membrane materials. Carbons and sulfates in soil will attack cold applied neoprene and certain rubber-based films and destroy them. A protection board has to be applied. If you can you should avoid using these types of films in high mineral soils. Get the education you need for an applicators license. The more you know, the better off your company and your clients will be. Getting trained and licensed in membrane applications is becoming a requirement in many states across the nation. Stay ahead of the curve with a certified and licensed crew for your waterproofing applications. When you are ready for more information about materials or training please contact us.